Computer Science Jobs and Career Outlook | University of Wis.
With a computer science bachelor’s degree, you are qualified for a wide range of computer science jobs such as applications developer, web designer, software engineer, and video game designer. And the outlook for these computing jobs is very bright. Why? Right now, the demand for computing professionals far exceeds the supply. Plus, technology evolves every day, meaning more and more computer science jobs will be created. For today’s computer science students, it won’t be a matter of finding a job after graduation, but rather, which job to accept when several offers come their way. Database administrator. Administers, tests, and implements computer databases and applies knowledge of database management systems. May also plan, coordinate, and implement security measures to safeguard computer databases. Network and computer systems administrator. Installs, configures, and supports an organization’s local area network, wide area network, and internet systems. May also monitor network and website performance to ensure availability and operability to all system users. Administrators can also supervise user support specialists and computer network support specialists. Application developer. Develops, creates, and modifies general computer applications or specialized utility programs. Optimizes operational efficiency by analyzing user needs and developing software solutions to meet those needs. May also analyze and design databases within an application area and supervise computer programmers. Web developer / web designer. Designs, creates, and modifies website content, graphics, performance, and capacity. May also integrate websites with other computer applications. Software developer / software engineer. Researches, designs, develops, and tests operating systems-level software, compilers, and network distribution software. Sets operational specifications and formulates and analyzes software requirements. Computer and information systems manager. Plans, directs, or coordinates activities in fields such as electronic data processing, information systems, systems analysis, and computer programming. Video game designer. Designs core features of video games, including game and role-play mechanics, storylines, and character biographies. May also create and maintain design documentation and collaborate with production staff to produce games. Systems engineer / systems architect. Design and develop solutions to complex applications problems, system administration issues, or network concerns. May also perform systems management and integration functions. Information security analyst. Plans, implements, and monitors security measures that protect computer networks, digital files, and electronic infrastructure. May respond to security breaches and viruses. Business analyst. Produces financial and market intelligence by analyzing data repositories and generating reports. Also devises methods for identifying data patterns and trends in information. The reason is, there are not enough qualified candidates to fill available job openings. In 2016, Code.org and the Computer Science Education Coalition published an open letter saying that there are over 500,000 computing job openings in all sectors, yet only 50,000 computer science students graduate per year. Over the next decade, more and more IT positions will be created. The U.S. Bureau of Labor Statistics reports that computer and information technology is one of the fastest growing fields in the country. 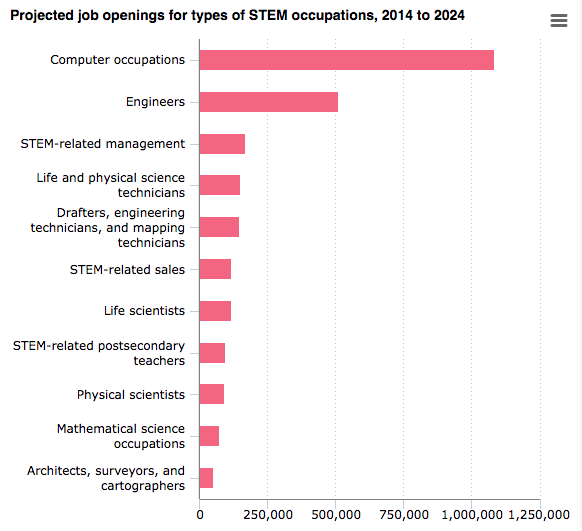 Between 2014 and 2024, projected job openings for computer occupations far exceed openings for engineers and all other STEM occupations. Because of the array of job titles, as well as the widespread reliance on the internet and the Internet of Things, computer science professionals will find opportunity in every sector, including manufacturing, education, banking, retail, government, agriculture, and healthcare. 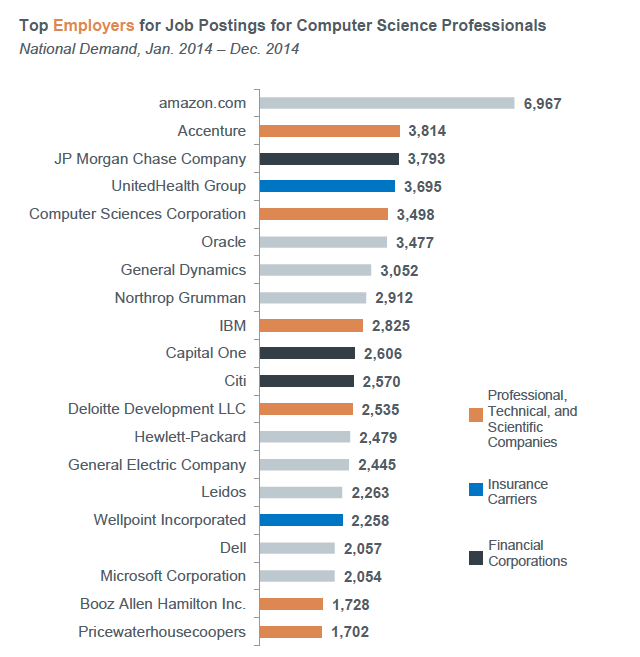 And who actually hires the most computer science professionals nationwide? In 2014, the employers with the most job postings were Amazon, Accenture, JP Morgan Chase Company, and UnitedHealth Group. 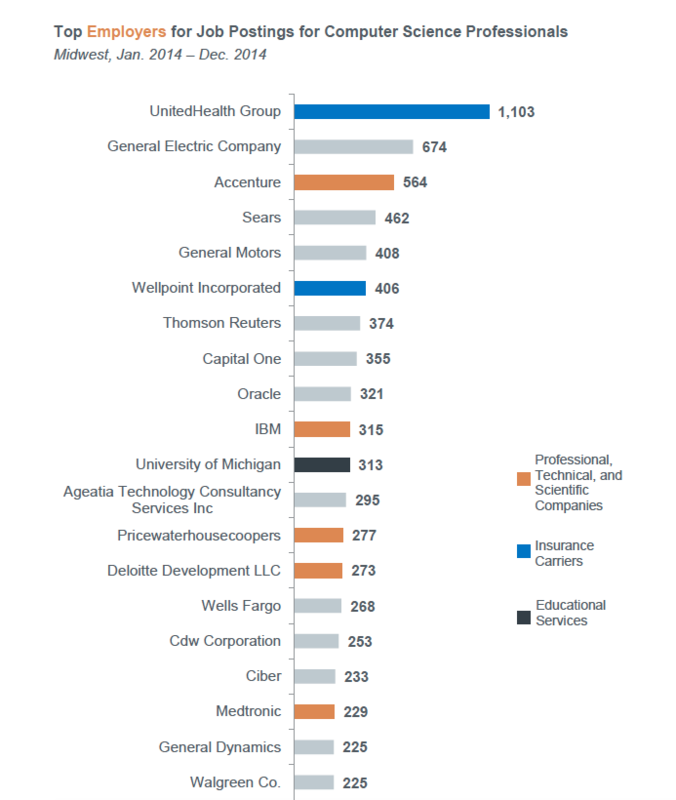 In the Midwest, employers with the most computer science job postings in 2014 were UnitedHealth Group, General Electric Company, and Accenture. Most of the computer science jobs listed on this page require a bachelor’s degree. Plus, more employers not only expect IT staff to have technical four-year degrees but also seek candidates with skills in workplace communication, business operations, project management, strategic thinking, and other advanced capabilities. The University of Wisconsin offers an online, 61-credit Bachelor of Science in Applied Computing. This well-rounded applied education teaches the technical IT skills you need to succeed in many computer science positions, plus business skills that will help you advance your career. What’s the difference between computer science and applied computer science? Click here to find out. Curious about what you’ll learn in UW Applied Computing courses? See the curriculum. Have questions about the online, 61-credit University of Wisconsin Bachelor of Science in Applied Computing? Contact an adviser at 1-877-895-3276 or learn@uwex.edu.